Iran’s Larijani with CNN’s Amanpour: Referendum for “All People” or “Elimination of Israel”? Despite probing questions from Christiane Amanpour, Ali Larijani, Iran’s speaker of the Parliament, successfully evaded answering her queries about Iranian plans to attack Israel yesterday on CNN. Several years ago, the Supreme Leader of Iran, Ayatollah Khamenei, came up with a solution for this problem, which I think is totally compatible with democratic principles. He said that the solution actually lies in a referendum. There should be a referendum in occupied territories and people — all people, Muslims, Jews and Christians — should participate in that referendum. And they should choose their own destiny. Whatever they decide should be implemented. And this solution is the one that Iran will adhere to. This is our — in our vision. And I think this is something that is, as I said, compatible with democratic principles. At this point, Amanpour does not question Larijani’s account of Khamenei’s referendum solution “compatible with democratic principles” and proceeds to move on to the next topic. 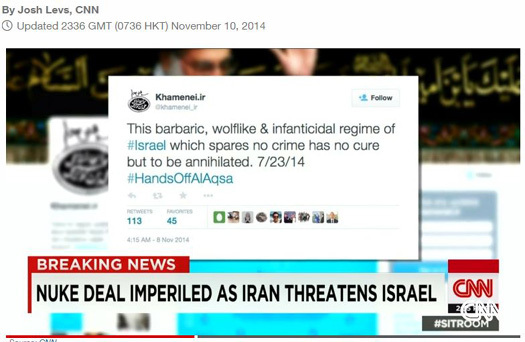 But as CNN’s own 2014 coverage of the Khamenei’s referendum “solution” for Israel shows, the Supreme Leader’s plan was for nothing less than the elimination of Israel. RANDI KAYE: A new controversy this morning involving Iran’s Supreme Leader — it’s over a tweet sent from Ayatollah Ali Khamenei’s official account that lays out a plan for wiping Israel off the map and it comes days after it was revealed President Obama President Obama reached out to him in an effort to take down ISIS. CNNchief national security correspondent Jim Sciutto live in Washington following this. Jim — good morning to you, tell me more about this tweet. JIM SCIUTTO, CNN CHIEF NATIONAL SECURITY CORRESPONDENT: Well, you know, it fits with the Supreme Leader’s general combativeness towards the West with particular towards Israel. It’s not the first time we heard this. You remember the previous president Mahmoud Ahmadinejad who in fiery public speeches would often make this call to wipe Israel off the map. Now the Supreme Leader in this series of tweets — you see his picture up there now — he had a ten-point plan that he tweeted out. This is the world we live in, right? The Supreme Leader of Iran is tweeting out a ten-point plan on this. He takes a different tack here. Rather than saying this should be done with force or military action but it should be done with a referendum where the people in Palestine and Israel, what Iran calls the whole area, Palestine, that they would vote to see what to do with the Jewish Israelis. And, of course, his assumption being that they would vote that they get pushed out. Listen, it’s another tack trying to cloak this very combative tone towards Israel in a legal structure but it comes from the same place. And it really shows you that in Iran you have this division, right, because from the current president Hassan Rouhani, the current foreign minister Javad Zarif is currently negotiating with the U.S. over its nuclear program, you will have friendly words coming out in public. But from the Supreme Leader who truly holds the power in Iran you have a very different tack. KAYE: And it’s so interesting because on one hand he’s saying he wants to arm the West Bank, places like Gaza. And then on the flip side of that he said we’re not talking about massacring the Jewish people. So it’s very interesting sort of what he does have to say there.